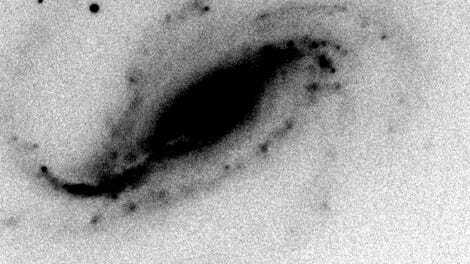 The supernovae (circled) appearing and fading. August 17, 2017 heralded one of the most important observations in astronomy’s history: two neutron stars colliding, sending both light and gravitational waves toward the Earth. But it left one question wide open: how two of these stellar corpses could have ended up orbiting each other in the first place. Scientists have now reported spotting a new kind of “ultra-stripped” supernova—one that ejects only a fraction of the expected amount of matter—that could explain the mystery. “We finally have evidence of the explosion that actually creates double neutron star systems,” CalTech graduate student Kishalay De told Gizmodo. This wasn’t a pure-luck discovery like some other supernovae are, said Mansi Kasliwal, professor at CalTech. 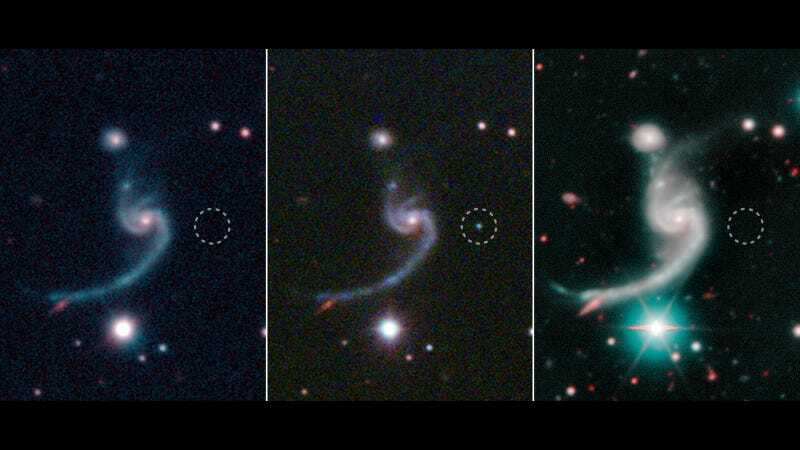 The explosion, now called iPTF 14gqr, first appeared in the intermediate Palomar Transient Factory (iPTF) survey on a telescope in southern California, indicating a supernovae in a galaxy nearly a billion light-years away. Some of the most important information from supernovae come in the spectral lines, the signature wavelengths of the light indicating the kinds of matter present, immediately following the flash. So the team needed to follow up with observations from four telescopes all around the globe. Unlike most supernovae that brighten for weeks or months, iPTF 14gqr dimmed after just a week. A typical large star ejects a few times the mass of the Sun when it goes supernova—but iPTF 14gqr appeared to only eject 0.15 to 0.3 times the mass of the Sun, according to the paper published in Science. That implied to the researchers that some small and extremely compact object was nearby to strip away the matter: an object like a neutron star, the fascinating objects a little heavier than the Sun but packed into the diameter of a small city. Mysteries remain about this explosion, Kasliwal explained to Gizmodo. It’s clear that a supernova occurred and likely resulted in a neutron star. It’s clear the companion was compact. But whether that companion was a neutron star, a white dwarf, or a black hole is unclear. The observation convinced Thomas Tauris, a professor at the Aarhus Institute of Advanced Studies in Denmark who was not involved in this work. Tauris worked on developing the theory of these ultra-stripped supernovae. “The authors succeeded with plenty of multi-wavelength observations shortly after the explosion, and the empirical evidence matches very nicely with theoretical expectations for such supernovae,” he told Gizmodo in an email. Tauris thought the helium envelope will be an important jumping-off point for further theoretical modeling.